Soil pH is an indicator of the acidity or alkalinity of a soil. Extremes in acidity or alkalinity may affect plant growth. Some plants can grow over a wide range of pH; others are sensitive to acidity, or alkalinity. It is hard to overestimate the importance of pH in agricultural systems. Soil pH is affected by soil chemistry and soil biology. Further, it is affected by the physical characteristics of the soil via the aeration of soil and soil water. How does soil pH affect plant growth? For most plants, the ideal soil pH is slightly acid or slightly alkaline. At extreme pH the availability of some nutrients is decreased, e.g. phosphorus and molybdenum at low pH, and zinc at high pH; and the solubility of elements toxic to plants is increased, e.g. aluminium and manganese at low pH. Extremes in alkalinity and acidity present problems for the production of many agriculturally important plant species and their symbiotic Rhizobia. Due to the complexity of soil chemistry, it has often been difficult to confidently identify the cause of poor plant growth or nodulation. What is an optimum soil pH? Most nutrients are at their maximum availability in slightly acidic, neutral or slightly alkaline soils. At the same time, most phytotoxic forms of aluminium and manganese are at their minimum concentration in this pH range. Emil Truog did some outstanding work over 60 years ago and his conclusions on how pH affects the availability of nutrients are still widely used today. How to measure soil pH? 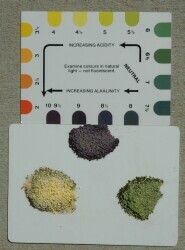 Soil pH may be measured on site using a colorimetric kit and a fresh sample. More reliably, it can be measured in a laboratory, using a prepared sample and a pH probe. As pH is usually measured as one of a suite of soil tests to assess fertility, the laboratory option is quite practical. How does soil pH vary with depth? pH varies within the soil profile. The pH of the whole soil profile or any horizon cannot be predicted by measuring surface soil pH. An undesirable pH in a lower soil horizon can constrain plant growth. How does soil pH vary within a paddock? In general, soil pH varies with soil type, topography and land management across the paddock. Multiple samples for each unique combination of soil type and land management practices are needed when sampling to test soil pH. Does soil pH change with time (and should I worry)? There is therefore an imperative to monitor pH changes and take action to remediate as required. In some instances, soil acidification has affected the subsoil as well as the surface soil. This presents difficulties for farmers as it is not easy to ameliorate acidified subsoils. Lime does not readily move down the profile. How can I change the pH of my soil? The most common way of increasing soil pH is applying agricultural lime. It is, however, an activity that requires a good application of science to be both effective and economic. Are there any common problems relating to pH in my area? Generally, the high rainfall districts of Victoria have acidic soils while the low rainfall districts have alkaline soils. A surface soil pH map of Victoria illustrates this generalisation. The map has been generated from samples of surface soil pH from farmer’s paddocks between 1973 and 1994. The publication ‘The impact of acid soils in Victoria’ is available here. Such state-wide statistics, combined with district averages, etc, can be used to guide an investigation, but unique combinations of paddock history, soil type, topography and climate at the paddock scale mean that different areas of a paddock have to be treated on their own merits. Such local peculiarities can produce deficiencies or toxicities of soil nutrients which are atypical for the district, the farm and the paddock. Further information about Surface Soil pH is available. Further information about the Nitrogen cycle is also available.